There has been so much debate about just how modern day brands can engage and remain engaged with that all important trend setting Millennial audience. But, there has been nowhere near that level of interest or focus on marketing to the UK’s more mature customers. This is slightly bemusing, as we are all very aware of the UK’s aging population, but maybe we have been side-tracked by the very real social impact that our aging population will cause? And perhaps, in this digital age, the over 50s are not seen to be such an exciting or receptive audience? But be under no illusions, the over 50s are diverse, savvy and increasingly important for the success of an awful lot of household brands. In the UK, over 50s make make-up more than 35% of the population and by 2020 the total number of people over 50 is set to reach 25.5 million. The over 50s have the highest disposable income of any age group. In fact, KPMG estimate that over the next ten years, two thirds of retail spending growth will come from shoppers aged 55 plus. Today, more than 11 million people in the UK are now aged over 65, which already represents some 17.1% of the total population. This means that the number of people in this age group has increased by 17.3% since 2003. And, this trend is set to continue with estimates showing that by 2050, there will be more than 19 million over 65s. Just like when marketing to Millennial, great care should be taken not to group the more mature audience into one huge group, and beware if you think that they are not digitally savvy, they are. It is clear that this new generation of mature customers behave very differently to generations that came before summarised beautifully by the fact that 40% of over 70s don’t consider themselves as old! 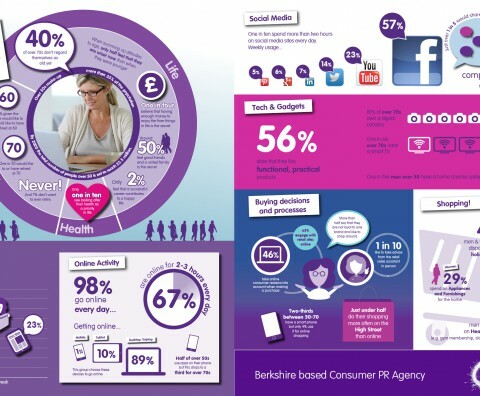 Consumer PR agency Escapade has undertaken some research into this growing audience. Take a look at its infographic for some fascinating insight into the behaviours, lives and opinions of this diverse and savvy group. Research undertaken in October 2014. Sample 1,000 over 50s.